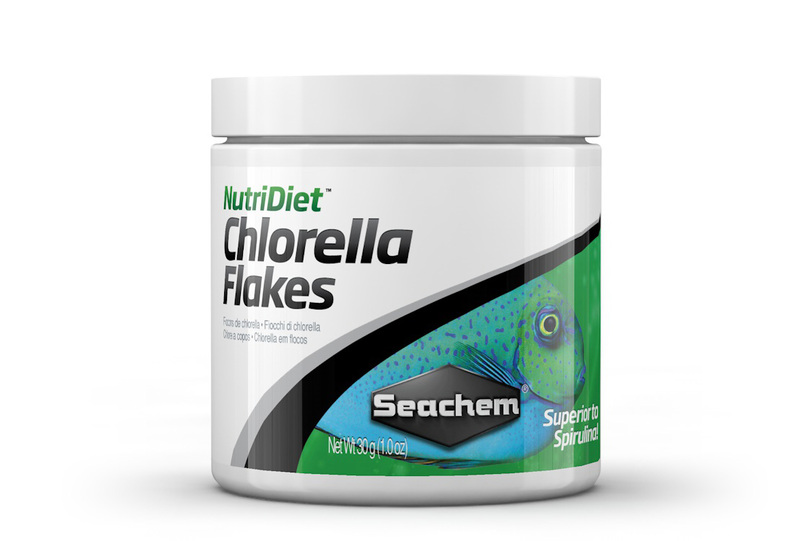 NutriDiet® Chlorella Flakes is a fortified Chlorella flake food for all freshwater and marine fish. Chlorella Algae is considered to be a potential super food and is included in every NutriDiet® Flake formula for its extremely high nutrient content. It is overflowing with enzymes, minerals, vitamins, amino acids, and all other nutrients essential to animal life. As a dietary supplement and base diet for herbivores, it is far superior to the Spirulina algae used in many flake foods. NutriDiet Chlorella contains GarlicGuard™, which, in addition to being an appetite enhancer, is a natural antiparasitic and antibacterial product that can enhance overall fish health. Chlorella Flakes also contain high levels of Vitamin C, a cofactor in the processes necessary for the formation of connective tissue, scar tissue in wound repair, and bone matrix. Vitamin C is difficult for fish to acquire in a natural diet but is critical in addressing healing and growth issues in many fish. Chlorella Flakes also contain proteinates and hydrolysates which allow for more rapid and simplistic digestion of the partner nutrients. Less energy is required by the fish to digest the food. The food is more completely digested allowing for less waste production in the aquarium. This also allows for more nutrient uptake and increased immune function. Lastly, patent pending compounds complete the formulation to enhance immune function further as well as extend life potential, promote natural growth, and enhance the color of fish. Many of the ingredients in NutriDiets® are present as proteinates and hydrolysates, making them much easier for fish to digest. This results in greater nutrient uptake by the fish and more complete digestion of the food. The fish benefits from receiving more nutrients from the food while expending less energy on digestion, and less nutrients are lost as waste in the tank, leading to better health for the fish overall. Seachem’s garlic-based product is added to all of the NutriDiet® flakes to enhance palatability with all fish. GarlicGuard™ also has natural anti bacterial and anti parasitic qualities that can enhance overall fish health long term. Garlic has been found to enhance thiamin absorption, and therefore reduces the likelihood for developing thiamin deficiency. It also has a high vitamin C content. It has shown promise as a medication in combatting protozoal disease. Allium sativum yields allicin, an antibiotic and antifungal compound (phytoncide). Garlic also affords the sulfur-containing compounds alliin, ajoene, diallyl polysulfides, vinyldithiins, and S-allylcysteine. Furthermore, it contains a phytoalexin (allixin), a compound with antioxidant effects, antimicrobial effects, and antitumor promoting effects. In addition, garlic has substantial amounts of beta-carotene, vitamins B1, B2, B3, B5, B6, B9, C, calcium, iron, magnesium, phosphorous, potassium, sodium, zinc, manganese and selenium. There are no questions for NutriDiet® Chlorella Flakes. Ask us a new question.